Hey everyone! We finally made it to the Bay Area! Yay!!! We took about a week to drive from Atlanta and it’s nice to finally be here in our new home! We have nothing but a suitcase full of clothes and a blow-up mattress to sleep on… unfortunately our household goods don’t arrive for another week – ugh. So I’m sitting here, in the only chair in the house, with my computer in my lap, and a bottle of beer on the floor as I write this post. I actually made and photographed this post prior to our departure from Atlanta, but I just ran out of time to get it out to you guys. It was meant to be a post for the 4th of July celebrations, and it looks like I just got it in under the wire! It’s no secret that I have a bit of a Bánh Mì addiction. Ok… it’s a serious Bánh Mì addiction. A Vietnamese sandwich with ingredients rooted in Vietnam and French colonial Vietnam – it’s the ultimate fusion food. It started off innocently enough, I found a local Bánh Mì shop, started eating lunch there everyday until I finally decided to make my own Bánh Mì. 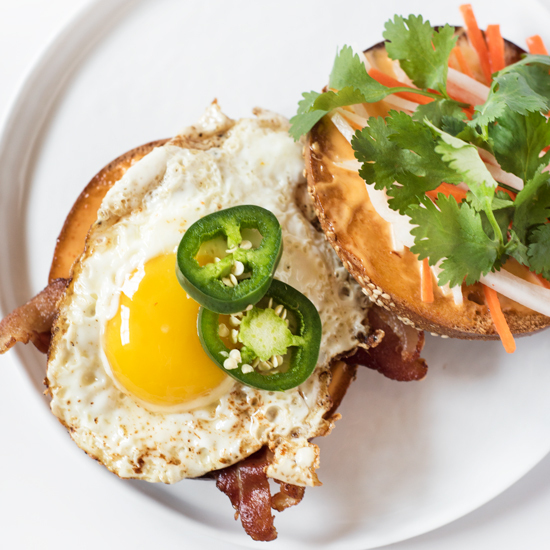 Like any good addiction I needed a bigger fix, so I made a Breakfast Bánh Mì Bagel. It was only natural that the next incarnation became a Bánh Mì Hot Dog. It may look like a lot went into it, but it takes just about as much time to throw together as any other hot dog with basic toppings. For quick assembly, make the do chua (a Vietnamese staple of pickled carrots and daikon), the night before. It’s super easy to make, but it does take a little time to julienne the carrots and diakon. If you want to make the do chua super fast, just shave the veggies using a vegetable peeler instead of cutting into a julienne, then pickle per usual (a hyperlink to make the do chua is in the recipe below). 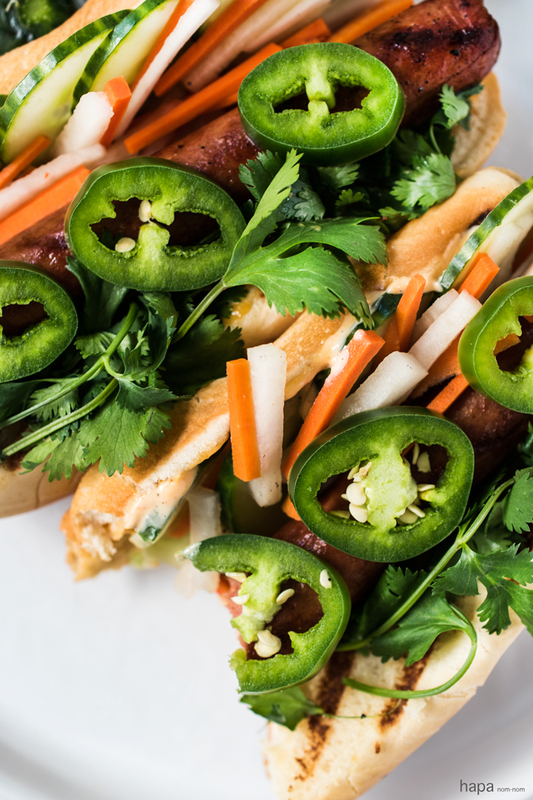 Classic America hot dog meets Vietnamese flavors loaded with spicy Sriracha-mayo, pickled carrots and diakon, fresh cucumbers, hot jalapeños, and earthy cilantro. Each bite has an a explosion of flavor… fireworks, if you will 😉 It certainly is not your traditional hot dog, but it’s sure to be a hit! Each bite of these Bánh Mì Hot Dogs have an a explosion of flavor! It certainly is not your traditional hot dog, but it's sure to be a hit! In a small bowl, combine the mayonnaise and Sriracha. Refrigerate until ready to use. Heat a grill to medium-high. Cook the hot dogs until you get those beautiful grill marks, turning occasionally, about 4 - 5 minutes. Add the buns, open side down. Cook until lightly toasted, about 30 seconds. To assemble - place the hot dogs in the buns, add the Sriracha-mayo, sliced cucumber, do chua, jalapeños, and a few sprigs of cilantro. Serve and enjoy! Hope you are settling in ok. Good luck! I love your Banh Mi hotdog idea! Every fall I get more daikon from my CSA than I know what to do with, so this I’ll have to keep this recipe in mind! An congratulations on your move! Welcome to Cali, the land of dreaming !! or something like that … San Francisco is amazing, I hope you go ride bikes across the bridge to Sausalito and then throw some of those fabulous hot dogs together, because you will be hungry ! Congratulations on your new home. Hope you settle in fast. I just love this idea it’s fabulous. Congrats that you finally finished the moving! I can’t believe that I’m finally going to Atlanta soon but you just left! I like all types of banh mi. This one is simply gorgeous and a great party food. Pinning! Thanks, Maggie! We are here, but it’s not quite finished yet. We’re still waiting on all of our items to arrive, which will hopefully be later on this week. Yay, so glad you arrived in SF safely. Hope you get all your furniture and get settled in soon! Love your addiction with Banh Mi! They’re SO good! This fusion hot dog looks even more amazing though! So flavorful and delicious! Oooh, how exciting, Kathleen! Congratulations on getting there … what a journey that must have been! All the best for your new start! The banh mi hot dogs sound wonderful, too. And actually quite simple once you’ve made the do chua. Banh mi hasn’t become a big thing over here yet, but I just love any kind of street food! Thanks, Helen! It was quite a trip getting out here, but we’re settling in nicely and exploring some of the neighborhoods. Thanks, Nicole! Yes, the biggest and hardest part is over. I can’t tell you how excited I am for our movers to deliver our household goods on Thrusday, I’m counting down the days! Denver is one of my favorites too! My husband lived there before we met and he absolutely loved it! We actually thought we were going to Denver… but work opportunities brought us to SF – both awesome cities! This absolutely cracked me up. You sound like me. When I find something I love, I become obsessed with it and eat it as frequently as I can. I’ve done the Banh Mi phase and you would be shocked if you knew how many days in a row I ate it. I am obsessed with Banh Mi as is the rest of Sydney. There are Banh Mi Wars as bloggers and foodies argue over where the “best” Banh Mi is. I honestly don’t think you could shock me with the number of days in a row you ate Banh Mi – go hard or go home, right!? As of lunch today I am officially obsessed with bahn mi too. So happy to have this recipe…I will probably tend toward the egg version. Because EGGS. i’ve been dying to make a banh mi sandwich but your hot dogs look delicious! Your recipe looks perfect and i’m putting it on my to do list-STAT! Man! I LOVE bahn mi! I’m a Bahn mi fanatic too! The Hot dog version must be awesome! So excited to try this out! Oh wow what a neat idea!! I love banh mi, but this is such a neat twist :-). Thanks, Sarah! Fusion dishes are always some of my favorites 🙂 Hope you have a lovely weekend! Your Banh Mi Hot dogs are over the top and what a great idea. I love the fresh topping ingredients. This would be a really fun make your own dog party and a few cold brews-perfect. You are one dedicated little blogger working on a post on move in day. Be good to yourself and take care. Congratulations on your move and go explore your new city!!! Pinned ! Drooling! Good luck with settling into the new house. Thanks! We’re having a great time exploring and eating 🙂 Hope you have a great weekend! That is one jazzed up hot dog. It certainly beats the ones I grew up eating. OMG it looks wonderful & sound a delicious. I’ll try it asap! These look / sound SO amazing! I loooovvee banh mis and what a great idea for a hot dog!! Genius!! Congrats on your move to the *best coast! 😉 Hooray!! Congrats! I think you’ll love SF… And these hot dogs look like perfection. 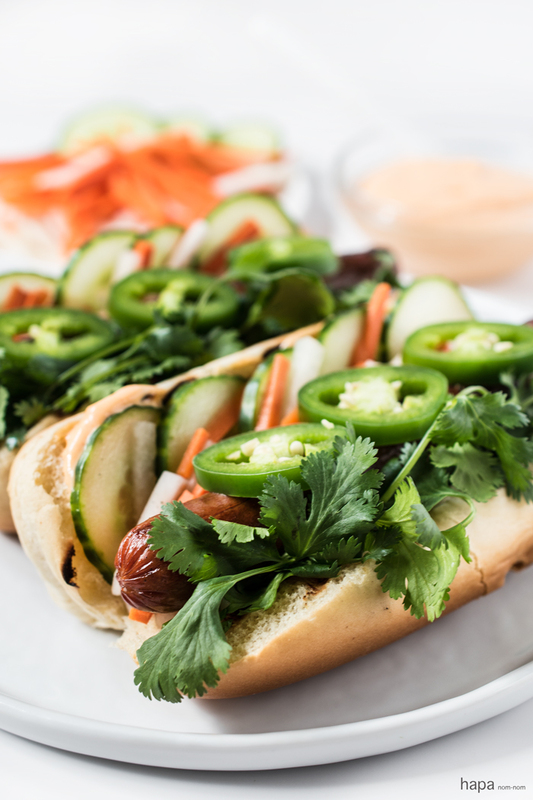 I’m a big fan of banh mi, so this twist on a hot dog is right up my alley! Thanks, Marissa. I think we’re going to love SF too – we’ve already had some pretty incredible food and the people have been great! I actually got a few recommendations on banh mi places around here, I can’t wait to try them out! Welcome to California, I really love the Bay area. I love this well dressed hot dog, so many great flavors going on. Thanks sweetie! We’re really loving it out here so far 🙂 Can’t wait to really get into the food scene out here! So glad your move is over! These hot dogs look so good ! Love them! Pinning! Bánh Mì Hot Dog—what a great idea! This is a hot dog with all the flavors that I love. I can relate to your obsession: I like many kinds of sandwiches, but nothing compares to bánh mì sandwiches. Enjoy your new home and the process of moving in. I hope it all goes smoothy! Isn’t Bánh Mì just the best!? I seriously want to make everything Bánh Mì.